One of the banks affected by the Offa robbery incident in Kwara State on April 5, 2018. Several persons were killed when about 30 gunmen suspected to be armed robbers invaded five commercial banks on Thursday in Kwara State. The incident was said to have occurred in Offa town, the headquarters of Offa Local Government Area of the state. The suspected armed robbers were said to have arrived in seven vehicles and stationed themselves in each of the banks around 4:30pm. 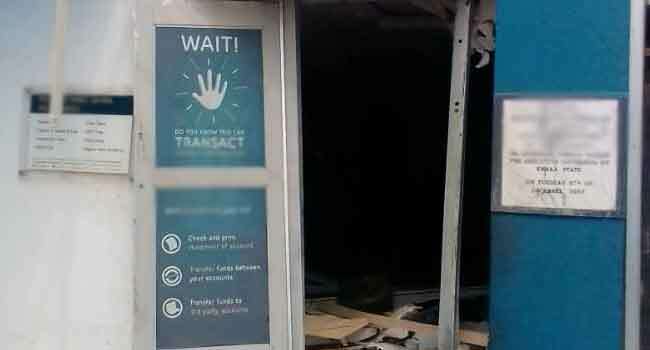 Channels Television crew who visited the scene reported that the doors were damaged, car windscreens shattered, vehicles burnt, and documents scattered on the floors of the affected banks. One of the medical doctors at the General Hospital Offa who spoke behind the screen disclosed that 21 bodies were brought in around 6.00pm and nine of them were police officers. At a private hospital also in the community, the doctor on duty confirmed the death of three victims while one was on admission. Some residents in the area who described the robbery as unfortunate and bloody have called for the provision of Armoured Personnel Carriers in Offa, saying the incident has become an affair of every five years.